Image: A cross section of mother-of-pearl, or nacre, shows calcium carbonate platelets arranged in layers separated by a biopolymer (top). 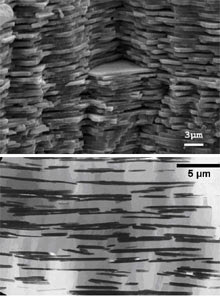 Researchers have mimicked nacre’s structure by dispersing aluminum oxide platelets in the biopolymer chitosan (bottom), which yields a nanocomposite that is strong, stretchy, and light. In their efforts to create strong yet light materials, chemists and materials scientists have long tried to mimic nanostructures found in nature. Shells, bones, and tooth enamel all consist of stiff ceramic platelets arranged in a polymer matrix like bricks in mortar. These hybrid materials combine the strength of ceramics and the stretchability of polymers. Researchers at the Federal Institute of Technology Zurich have dispersed tiny platelets of aluminum oxide in a polymer to make a material that is tough, stretchy, and lightweight. A film of the composite is already as strong as aluminum foil, but if stretched, it can expand by up to 25 percent of its size; aluminum foil would break at 2 percent. An added advantage of the hybrid material is that it's light, says Harvard materials scientist Andre Studart, who was involved in the work. The material is half to a quarter as heavy as steel of the same strength and it would make a good substitute for fiberglass, which is commonly used in car parts. Because the material's strength comes from the platelets diffused through it, it is strong in two directions, not just one direction, as is the case of fiber-reinforced material. Moreover, while the material is translucent now, its structure could be modified to render it transparent, making it suitable for dental material and transparent electronic circuits.